One Great Teacher Can Change The Lives Of Thousands. We believe great teachers are the building blocks of a brighter future. Golden Apple prepares highly-effective teachers for rural, suburban and urban schools-of-need in Illinois. Through our Scholars Program, we are committed to making a material difference in resolving the Illinois teacher shortage by recruiting, preparing, placing, mentoring and retaining high-quality teachers in schools throughout Illinois. There are more than 3,400 schools-of-need in Illinois. Scholars teach in just under 500. 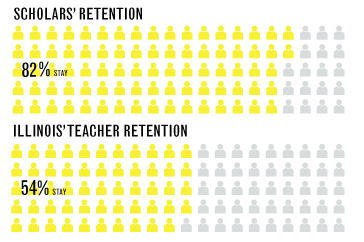 Over 80% of Scholars stay in teaching for more than five years. Be an agent of change in your classroom and community. As a Golden Apple teacher, you will be uniquely prepared to help your students achieve their dreams, while you achieve yours. High school teachers and Pre-K-12th grade school leaders to be honored at the Golden Apple Awards for Excellence in Teaching & Leadership on May 18, 2019.